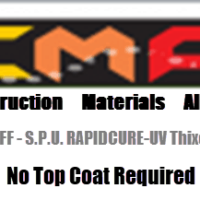 Cementitious waterproof membrane coating for concrete, brick, cement, blocks and masonry. Waterproofing basements, retaining walls, car parks and foundations. Swimming pools, irrigation channels, tunnels, dams, water tanks and treatment plants as it is non-toxic. May be tinted, painted or tiled over. Just add water. Coverage: 1kg per square meter per coat. 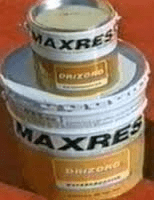 Drizoro Maxseal Foundation – A cement based waterproof membrane coating for concrete, brick, cement, blocks and masonry. Used for waterproofing basements, retaining walls, car parks and foundations. Also suitable for swimming pools, irrigation channels, tunnels, dams, water tanks and treatment plants as it is non-toxic. May be tinted, painted or tiled over. Just add water. Waterproofing of retaining walls, car parks, basements, elevator pits, below grade ingress of water in foundations. It can also be used as waterproofing layer or barrier against humidity by capillarity on a variety of mortar substrates. Good adhesion, it becomes part of the substrate , fills and seals all pores, missing mortar lines etc. Can be rendered or painted over. NOT affected by salts and acids in soil. Easy to apply with Drizoro brush. Will seal against positive and negative water pressure. The surface to be coated must be sound, clean, free of traces of paint, loose particles, dust, grease, mould release compounds, gypsum, efflorescence. It is the applicator’s responsibility to determine the presence of (salt) efflorescence prior to application. Remove efflorescence using Efflorescence Rid and apply Sealtight Clear to the affected areas to block salt from penetrating. To obtain a good bond to concrete or masonry surfaces, it needs to be a medium to high porosity substrate. If low porosity Drizoro Maxseal Flex should be used. At the wall/floor junction, cut a 2×3 cm. slot, refill it with Drizoro Maxrest or Drizoro Maxplug or Drizoro Maxjoint Elastic. If honeycombing is present in concrete, patch it with Drizoro Maxrest. Concrete scaffolding wires or passing rods must be cut and patch with a minimum 1 cm. deep must be made, then patch with Drizoro Maxrest. Important: Drizoro Maxseal Foundation can only be applied to a wet surface, No other primer or other product is required except in areas where salt treatment has been carried out. Apply Drizoro Maxseal Foundation in these areas while surface is still wet with Sealtight Clear. Concrete and masonry foundation walls subject to extreme pressures and water aggressiveness. Please use our contact form to contact our office. Pour clean water in a bucket and add Drizoro Maxseal Foundation, ratio approx 3.5kg powder to 1 litre of water mix slowly with electric drill (400-600 rpm) obtaining a thick creamy paste. 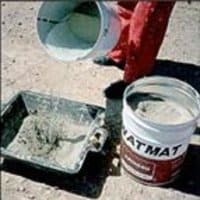 Let material rest for 5 minutes before application. A 25 Kgs. 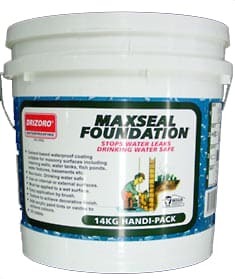 Drizoro Maxseal Foundation bag requires 7-7.5 Iitres. of water. Do not apply in excess of 2 layers. Do not apply to bitumen or polyurethanes. Do not place plastic or core flute protection boards against treated surfaces prior to back filling. Drainage cell and aggregate can be placed. During curing, water vapour may condense on the Surface in poorly ventilated areas. Place exhaust fan or heat source to eliminate moisture saturated air. Allow surface to cure for 3 days prior to back filling and 7 days prior to filling structure with water. Drizoro Maxseal Foundation cementitious waterproof membrane coating is applied by brush, Maxbrush Or Broom to ensure penetration into pores and hollows. Apply at a thickness of approx. 1 mm to form a continuous and even coating, do not extend as paint and apply only in one direction. Second layer must be applied crosswise. 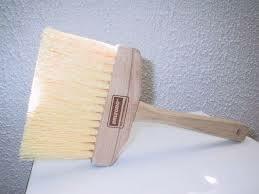 After material application, clean brushes with water for further use. At summertime temperatures, wet the surface with abundant water to cool surface. If fast drying is observed, water can be mist sprayed 2 hours after the product application. In winter time do not apply at temperatures below 5 C or if lower temperatures are expected within the next 24 hours after the application. It must not be applied on frozen or icy surfaces. Optimal working temperature is between 15 to 28 C.
Avoid application when rainfall is expected within the next 4-6 hours further to application. 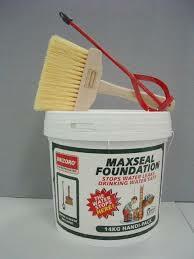 As all cement products Drizoro Maxseal Foundation is an abrasive compound. It is not toxic but care should be taken while mixing and applying , do not to let it come into contact with the hands. Rubber gloves should be worn for protection. If it splashes in the eyes, rinse well with clean water; do not rub.